II. Country (State): Mexico (Baja California, Sonora), United States (Arizona, California). This entry focuses on the Sonoran Desert north of 30 degrees latitude and the Chihuahuan Desert west of 110 degrees longitude. The sky islands of the Sierra Madre Occidental, which poke above the Chihuahuan Desert, are also discussed, as is the northernmost Baja California Desert as it grades into Mediterranean California. Because of the two U.S. States and three Mexican states (Baja California, Sonora, and Sinaloa) involved in the Sonoran Desert, the Sonoran Joint Venture has been established to coordinate and direct bird conservation funds toward the highest priority needs in the area. At the Yuma Crossing area where four of the states come together, the project seeks to recreate habitat for the southwestern willow flycatcher and the Yuma clapper rail by restoring marshes, removing tamarisk and other invasive plants, and revegetation of the area. These activities are taking place both north of the border and south in Santa Clara marsh in Sonora and Baja California (Cohn 2005). The Sonoran Desert is usually noted as being unusually lush in vegetation for a desert. There are cacti and other succulent plants that focus on water storage. Those that do not store water complete their life cycle quickly after rains and before the next drought begins. The lush plant growth may be because the area has alternated among different states including a tropical dry forest, savanna, chaparral, and thorn forest before becoming the desert of today. The ancestors of the desert plants lived in cooler and moister climates, and their descendants adapted to increasingly drier conditions over an 80 million year period (Mohlenbrock 1986). In addition to the saguaro, the Sonoran Desert hosts the unique elephant tree (Bursera microphylla), which has a population centered on the Barry M. Goldwater Air Force Range of southwestern Arizona. The tree provides food for the gray vireo in its wintering areas in the Sonoran Desert. The gray vireo is a rare bird of the southwestern arid lands. The beak of the vireo opens just wide enough to eat elephant tree fruits. In fact, it appears that the bird’s winter distribution matches the distribution of the elephant tree. Some of the important winter habitat for the vireo is located on the Goldwater Air Force Range property in southwestern Arizona (Arnett 2011). By the 1890s, the new Euro-American settlements of southeastern Arizona were already overgrazed and a severe drought was in progress. As many as 50 to 75 percent of all cattle had died. This crisis led to scientific research on how many cattle the grasslands of the northwestern Chihuahuan Desert could sustain. As more and more is known, the carrying capacity has been reduced. The 50,000-acre site was originally believed suitable for up to 1,200 cattle, but today the number is 600 to 700. Sustainability is maintained by breaking the site into pastures, and cattle are rotated based on the health of the pasture. This research area, where cattle were fenced out and the carrying capacity of the desert range was established, is today the Santa Rita Experimental Range. Today, Santa Rita is part of the National Ecological Observatory Network which seeks to study the impacts of long-term climate change. The Sonoran Desert is also a focus of renewable energy development. The EnergySource geothermal plant went on-line in 2012 adjacent to the Salton Sea. It obtains power from the Salton Sea geothermal resource area, which has a resource potential of up to 2,000 MW, of which 330 is developed. Geothermal development relies on deep wells to tap hot water; those at EnergySource extend 7,500 feet deep. The briny liquid extracted from the wells is returned via injection wells. The advantage of geothermal is that it can be run as baseload power while other renewables tend to be more intermittent (Trabish 2012). To the west of Blythe along I-10 and adjacent to the Palen-McCoy Wilderness is the site for the Genesis Solar Power Project, a 250-MW development using parabolic trough technology to concentrate sunlight and generate electricity. In 2010, the project received BLM approvals for construction and a Department of Energy loan guarantee. During the review, the project was found to include several archaeologically important cultural landscapes. The approval required that Genesis document three cultural landscapes prior to construction. One was a Prehistoric Quarries Archaeological District and another was a Prehistoric Trails Network archaeological landscape. A third landscape was historic-period archaeological sites that contribute to a World War II Desert-Training Center California-Arizona Maneuver Area Historic Landscape. However, human remains have also been found along a transmission line connection to the site. Although the Programmatic Agreement for the project contained measures for the handling of human remains, these and two other human finds have prompted concerns from the Colorado River Indian Tribes that the previous archaeological surveys of the area were not comprehensive (BLM 2010; Sahagun 2012). As if to reinforce the cultural resource criticisms of the project, a rare flood in the summer of 2012 caused some roads to be washed out and some equipment to be damaged. One of the most famous and long-running battles in environmental history, alongside the snail darter and spotted owl, is the battle over a mountain and the siting of an astronomical observatory in the middle of a mountaintop forest which is the sole habitat for the Mount Graham red squirrel. The Pinaleno Mountain range already had a road to the top and some development of vacation cabins. Therefore, it was initially not viewed as pristine when it was proposed for an astronomical observatory. However, biological studies indicated the mountain had been an isolated sky island for some 11,000 years, and new species of insects were found. The most critical species was the Mount Graham red squirrel, whose numbers were estimated as only 300 (Waldrop 1990). The observatory was eventually built and today houses three telescopes. However, the controversy is not over, and suits seeking to protect the squirrels under the Endangered Species Act continue. Nearactic (NA) 302, Sierra Madre Occidental pine-oak forests. These forests occur as isolated sky islands on mountain peaks between 1,500 and 3,300 m in elevation. Drier areas have chaparral and oak-grassland vegetation. The region is known for endemic birds such as the thick-billed parrot, tufted jay, eared quetzal, and green-striped brush finch; 22 endemic reptiles; and 12 endemic amphibians. The mountain air currents are a major migratory pathway for the monarch butterfly. Found in Arizona and Sonora. NA 1301, Baja California desert. The mountains, plains, and dunes host xeric scrub of cacti, Ambrosia, and Erodium. In low humid areas epiphytes are present. Endemic mammals include the San Quintin kangaroo rat and Baja California rock squirrel. Found on the western side of the Baja California peninsula in Baja California. NA 1303, Chihuahuan desert. This isolated desert and grassland is known for prairie dog, bison, and antelope. The dominant plant is creosote bush, along with tarbush and acacia. There are up to 1,000 endemic plant species, including one-fifth of the world’s cacti. Found in deep valleys reaching into the mountains of eastern Sonora and southeastern Arizona. NA 1310, Sonoran Desert. The desert most famous for the saguaro cactus and other columnar cacti also contains creosote bush, ironwood, palo verde and other cacti in drier areas. Found in Arizona, Baja California, California, and Sonora. 130, Colorado, includes the lower Colorado River and the Bill Williams River in the Sonoran Desert of Baja California, California, and Arizona. There are distinctive fishes adapted to turbid, fast-flowing waters and a high level of endemism in the fish fauna. 131, Gila, is a Colorado River tributary in Arizona and is separately delineated from the Colorado ecoregion because 20 percent of the aquatic species are endemic. The river is noted for speciation in chubs. 159, Southern California Coastal-Baja California, contains few permanent watercourses. Streams contain a marine-derived fish fauna including killifish, lamprey, and sculpin. 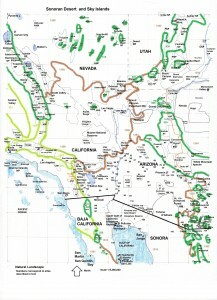 160, Sonora, includes rivers in Sonora including the Rio Sonoyta and Concepcion in the map area. The ecoregion has endemic Opata sucker and desert chub. 59, Southern California Bight, is found along the Pacific Coast of terrestrial ecoregion NA1301. 60, Cortezian, is found in the Sea of Cortez adjoining Baja California and Sonora. • Islands of the Gulf of California Flora and Fauna Reserve (IGCFFR), Baja California and Sonora (site 1 on map). This includes 232 islands, nine of which fall within the map area. These are Cholludo, Gore, El Huerfanito, Lobos, Montague, El Muerto, El Pelicano, San Jorge, and San Luis. Gore, Montague, and Pelicano are also in the Upper Gulf of California Biosphere Reserve. The Gulf of California is a high salinity, shallow gulf. The islands are listed because of striking natural beauty, 90 endemic fish species, 39 percent of the world’s marine mammal species, and one third of the world’s cetacean species. An endemic fish, totoaba, and an dolphin, cochito, are found in the shallow Upper Gulf of California. Terrestrial ecoregion NA 1310; marine ecoregion 60. • Upper Gulf of California and Colorado Delta Biosphere Reserve, Baja California and Sonora (2). The three mouths of the Colorado River and the swamp of La Ramada support 100,000 shorebirds annually. In the Colorado delta, the Santa Clara Marshland offers guided tours from Ejido Luis E. Johnson. The reserve includes the former outlet of the Colorado River and is also a Ramsar Site, biosphere reserve, WHSRN site, and an Important Bird Area (IBA) of BirdLife International. Terrestrial ecoregion NA1310; marine ecoregion 60. Gulf of California Islands (1), Sonora. See World Heritage list above. Mojave and Colorado Desert, California. 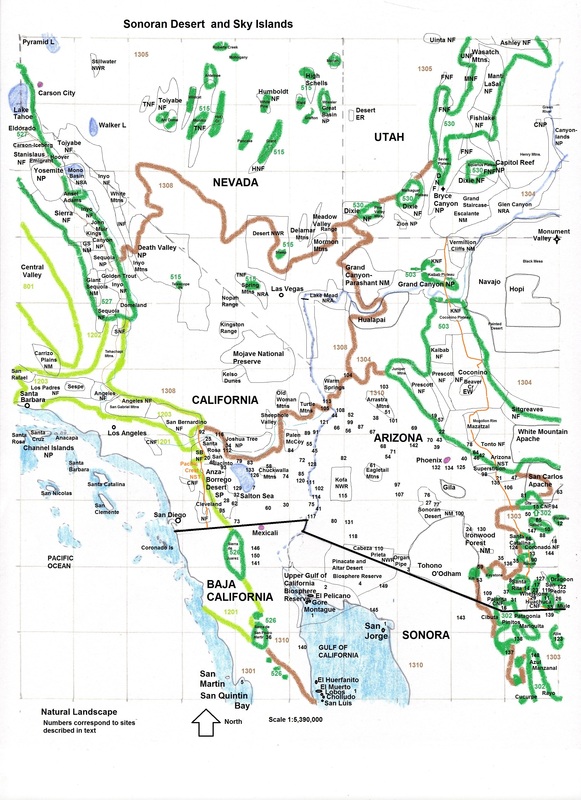 A multi-unit biosphere reserve including Death Valley National Park, Joshua Tree National Park, Santa Rosa and San Jacinto Mountains National Monument, Anza-Borrego Desert State Park, and Philip L. Boyd Deep Canyon Desert Research Center in Palm Desert, California. Each of these sites is described in a separate entry below except for Death Valley, which is described in the Mojave Desert ecosystem post. Ecoregion NA1308 and NA1310. Organ Pipe Cactus National Monument, Arizona (3). The monument preserves the range of organ pipe cactus in the U.S., along with 550 other species of plants, including a diversity of other cacti and Sonoran desert plants and animals. The pollinator of organ pipe cactus, the lesser long-nosed bat, is an endangered species. The Senita Basin has a diversity of cactus and elephant trees. The Ajo Mountain and Puerto Blanco roads provide access to a range of desert topography and vegetation. Organ Pipe Cactus is a unit of the Sonoran Desert Borderlands IBA and is noted for pygmy owl. Ecoregion NA1310. El Pinacate and Altar Desert Biosphere Reserve, Sonora (4). The biosphere reserve designation for the Upper Gulf of California and Colorado Delta Biosphere Reserve (see description under World Heritage Sites in Section VII) includes El Pinacate and Altar Desert Biosphere Reserve in Sonora. The Pinacate is a 600-square-mile volcanic area on the east side of the Altar Desert. The area of cones, craters, and lava flows was formed about 50,000 years ago. The highest peak is 3,960 feet. There are over 400 volcanic cinder cones, some of which were formed by steam explosion when lava contacted ground water. The largest crater is El Elegante, 700 feet deep and 1,500 feet across. Molina Crater looks like a clover leaf on the map and is the intersection of three circular craters. Saguaro and ocotillo grow in some of the crater floors. The Altar Desert contains the largest active dune field in North America. It is noted for unusual star dunes but also has crescent dunes. Vegetation of the reserve is predominantly cholla and mesquite. Ecoregion NA1310. Colorado Delta Wetlands, Baja California and Sonora (2). See Upper Gulf of California World Heritage Site. San Quintin Lagoon Complex, Baja California (5). The site supports 35,000 shorebirds, including plovers, willet, curlew, and godwit, along with endemic plants in the genera Astragalus and Chorizanthe. A collapsed cave along the southern portion of the bay is La Lobera, which is a sea lion viewing area. San Quintin is also an IBA and a unit in the Western Hemisphere Shorebird Reserve Network. Ecoregion NA1301. Colorado River Estuary, Baja California and Sonora, Mexico (6). See description under Upper Gulf of California and Colorado Delta world heritage site. Montague and Pelicano Islands are also part of the WHSRN site. San Quintin Lagoon, Baja California (5). See description under Ramsar sites. Sonny Bono Salton Sea National Wildlife Refuge (NWR), California (7). In addition to providing habitat for 100,000 ducks and geese, the refuge supports more than 20,000 shorebirds, including the Yuma clapper rail, laughing gull, wood stork, black tern. The largest breeding colony of double-crested cormorants is also in the area. The Salton Sea was formed in 1905 when a dike burst along the Colorado River. There is no outlet. The water level is rising from irrigation inflows, and is also getting saltier with time. The area is included in the Salton Sea and Imperial Valley IBAs. Ecoregion NA1310. Santa Rita Experimental Range, Arizona (8). Established by the Forest Service in 1903 and now managed by the University of Arizona, the research site measured what would today be called the carrying capacity of rangeland. Researchers fenced out cattle and measured the regeneration of grassland. Now the 50,000-acre research site near Green Valley is part of the NEON network that will study long-term climate change over a 30-year period. Ecoregion NA1303. Dragoon Mountains (9) are notable for huge granite domes and canyons. The area is rich grasslands and grass-dominated woodlands. There are three rare mollusk species. Ecoregions NA302 and NA1303. Galiuro Mountains (10) are an isolated range northeast of Tucson and northwest of Willcox. The mountains are known for precipitous topography and are included in the Galiuro Wilderness (see). Ecoregions NA302 and NA1303. Huachuca Canelo, and Patagonia Mountains (11). This unit contains Ramsey Canyon, a National Natural Landmark, and six perennial streams. The Huachuca Mountains are an IBA for rare neotropical birds. Scotia Canyon, northwest of Miller Peak wilderness, is rich in sensitive species, especially reptiles, amphibians, and mollusks. Ecoregions NA302 and NA1303. Pinaleno Mountains (12) are the tallest sky island in the US, rising to 10,720 feet at Mount Graham (just east of the map area). See discussion in part III on the squirrels of Mount Graham. Ecoregion NA302 and NA1303. Santa Catalina Mountains (13), located east of Tucson, contains the Sky Island Scenic Byway, which climbs from Sabino Canyon to Mount Lemmon through five life zones, the desert, grassland, pinyon-juniper, ponderosa pine, and alpine. Finger Rock Canyon is known for seven sensitive plants, and Agua Caliente Zoological Area is rich in reptiles and amphibians. Pusch Ridge and Rincon Mountain Wilderness areas (see) are located here. Ecoregions NA 302, NA1303, and NA1310. Santa Rita Mountains (14) are located between Nogales and Tucson. Madera Canyon, east of I-19, is a birder’s paradise and the hummingbird capital of the U.S. The Santa Rita Mountains are also an IBA. Adjoining the Santa Ritas is another IBA, Tanque Verde Wash/Sabino Canyon. This area in the southern edge of the Santa Catalina Mountains is an IBA for Abert’s towhee. Onyx Cave National Natural Landmark (see) and Mount Wrightson Wilderness (see) are located here. The Santa Rita Experimental Range, located in the northwestern portion, was the first experimental range, established in 1903, and is currently managed by the University of Arizona (see NEON entry). Ecoregions NA302 and NA1303. Santa Teresa Mountains (15) are the northernmost unit of the sky islands, located adjacent to the San Carlos Apache Reservation. Rock formations, deep canyons, and steep terrain are characteristic. Chaparral dominates the Santa Teresa Wilderness (see). Ecoregions NA302 and NA1303. Tumacacori, Atacosa, and Pajarita Mountains (16) are west of Nogales. The unit borders Buenos Aires NWR (see) and the mountain ranges extend south into Mexico, forming a continuous Madrean oak woodland. Sycamore Canyon, west of Nogales on the Mexican border, contains rare plants and animals for the U.S. including the jaguarondi. It is an IBA for high bird diversity and rare Mexican species. California Gulch, also west of Nogales, is an IBA for five-striped sparrow. Pajarita Wilderness (see) is located here. Ecoregions NA302 and NA1303. Whetstone Mountain (17) is an isolated mountain which contains limestone and is known for caves on the east side of the range. Kartchner Caverns State Park (see) is located just east of the forest property. French Joe Canyon provides riparian habitat for rufous-capped warbler. Ecoregions NA 302 and NA1303. Winchester Mountains (18) are north of I-10 and west of Willcox, and are an isolated range of oak-pine woodlands. Ecoregion NA1303. Prescott NF, Arizona (19). In the high desert are flowering yuccas, agaves, and cacti, whereas at higher elevations pinyon-juniper and oak grow. Included in the forest are Apache Creek, Castle Creek, Cedar Bench, Granite Mountain, Juniper Mesa, Pine Mountain, Sycamore Canyon, and Woodchute Wildernesses. Ecoregions NA503 and NA1310. San Bernardino NF, California (20). The Rim of the World and Palms to Pines scenic byways provide access to the San Bernardino and San Jacinto Mountain ranges. The Santa Rosa and San Jacinto wildernesses are shared with the Santa Rosa and San Jacinto National Monument. Ecoregions NA 1201, 1203, 1308, and 1310. Tonto NF, Arizona (21). The southern parts, such as the Superstitition Wilderness, are in the Sonoran Desert, with saguaros, cholla, and cacti, while in the north this grades to a ponderosa pine forest. The Mazatzal, Sierra Ancha, and Superstition wilderness areas are in the forest. Cave Creek downstream from Seven Springs north of Carefree is an IBA. The Verde River in the Mazatzal Wilderness downstream to the confluence with the Salt River, and the Salt River downstream from Saguaro Lake in this NF are an IBA for bald eagle, yellow-billed cuckoo, and southwestern willow flycatcher. Ecoregions NA503 and NA1310. Agua Fria National Monument, Arizona (22). A high mesa area of desert grassland is located 40 miles north of Phoenix adjacent to I-17. The plateau is associated with a dormant volcano. The riparian areas along the Agua Fria River are an IBA. Ecoregion NA1310. Las Cienegas National Conservation Area, Tucson BLM District, Arizona (23). Marshlands, cottonwood forests, oak woodlands, and grasslands are found on a working ranch. The historic ranch house dates to 1870 and is operated by the Empire Ranch Foundation. The southern edge is part of the Appleton-Whittell Research Ranch of the National Audubon Society (see). Ecoregions NA302 and NA1303. Ironwood Forest National Monument, Arizona (24). The site contains vegetation typical of the Sonoran Desert. Dominant species are the saguaro cactus and trees of the legume family, including palo verde, acacia, ironwood, and mesquite (Mohlenbrock 2011). The monument includes parts of the Pan Quemado, Roskruge, Silver Bell, Ragged Top, Sawtooth, and Waterman Mountain ranges. Vegetation is about one half scattered saguaro and ironwood and one half creosotebush and bursage. There are small areas of jojoba chaparral on Silver Bell Peak and a cholla forest in the Pan Quemado Mountains. The Los Robles and Cocoraque Butte archaeological districts are included in the monument. Ecoregion NA1310. Santa Rosa and San Jacinto National Monument, California (25). With elevations ranging from sea level to 10,000 feet, a diversity of natural landscapes are present, ranging from the desert to pinyon-juniper to limber and lodgepole pine. The San Jacinto Mountains rise almost 10,000 feet in seven horizontal miles. The mountains overlook the rapidly urbanizing Coachella Valley. Streams and seeps support palm oases. The San Jacinto Mountains are the northern end of the Peninsular Range, which extends south the length of Baja California. The monument includes the Agua Caliente Indian Reservation, Hidden Palms Ecological Reserve, Boyd, Phillip J., Deep Canyon Research Center (UC Riverside), Carrizo Canyon Ecological Reserve, the Living Desert (zoo and botanical garden), Magnesia Spring Ecological Reserve, Mount San Jacinto State Park and Wilderness, Palm Canyon Creek National Wild and Scenic River, Palm Springs Aerial Tramway, Peninsular Ranges Ecological Reserve, Santa Rosa Wilderness, and part of San Jacinto Wilderness. Ecoregions NA1310 and NA1201. San Pedro Riparian National Conservation Area, Tucson BLM District, Arizona (26). One of the most important natural areas in the Southwest, the San Pedro River is lined with riparian vegetation within the Chihuahuan Desert. The NCA protects 40 miles of the river. It is one of the most important migratory bird corridors in the Southwest, along with the Rio Grande, Santa Cruz, and Colorado Rivers. It is an IBA because of this. It contains the Spanish Presidio Santa Cruz de Terrenante historic site and Murray Springs Clovis archaeological site. Ecoregion NA1303. Sonoran Desert National Monument, BLM Lower Sonoran Field Office, Arizona (27). Mountain ranges (Javelina, Maricopa, Sand Tank, Table Top, and White Hills) punctuate an extensive saguaro cactus forest. The monument Includes the North and South Maricopa Mountain Wilderness Areas and Table Top Wilderness, which are all described in separate entries. Ecoregion NA1310. Anza-Borrego Desert State Park, California (28). The best examples of the biotic and geologic phenomena of the Colorado Desert (the California portion of the Sonoran Desert) are here. In wetter years, the spring wildflower display in February and March is notable, and composed of plants such as the desert sand verbena, dune evening primrose, desert chicory, and desert lily (Gibbons 2011). The Elephant Tree Forest, made of Bursera trees, is an IBA for gray vireo. Springs are found on the eastern side of the mountains, watering palm oases. The riparian areas of the park support groves of fan palm and are an IBA for least Bell’s vireo, long-eared owl, and Swainson’s hawk. Desert bighorn sheep are in the high areas. Major attractions are Borrego Palm Canyon, Tamarisk Grove and Yaqui Well, Mountain Palm Springs, and Blair Valley pictographs. Ecoregion NA1310. Canelo Hills Cienega Reserve, The Nature Conservancy, Arizona (29). This wet desert grassland along O’Donnell Creek at 5,000 feet elevation is located at the town of Canelo on Route 83. The preserve protects one of four populations of the Canelo lady’s tresses orchid. It was designated because it is the least disturbed southwestern desert wet grassland habitat. Ecoregion 1303. Imperial Sand Hills, BLM California Desert District, California (30). Dune heights reach 300 feet in one of the largest natural dune areas in the U.S., extending 40 miles in length by five miles in width between the Mexican border and the Chocolate Mountains. It is the most popular off-highway vehicle area in the U.S., also. Basins between the dunes contain some desert vegetation. This NNL includes the North Algodones Dunes Wilderness and is part of the Colorado Desert Microphyll woodlands IBA for long-eared owl, elf owl, and Gila woodpecker. Sensitive species include the Peirson’s milk vetch and desert tortoise. Ecoregion NA1310. Onyx Cave, Coronado NF, Arizona (14). Considered the finest cave in Arizona, the one-half-mile-long cave is located in the Santa Rita Mountains to the east of Mount Wrightson in Gardner Canyon. 31-43, 110-47. Ecoregion NA302. Patagonia-Sonoita Creek Sanctuary, The Nature Conservancy, Arizona (31). Sonoita Creek, lined with 100-year old Fremont cottonwoods and a riparian woodland, is among the top birding spots in the country, counting a diversity of flycatchers among its inhabitants. It is the only known US nesting spot of the rose-throated becard. The preserve is located one mile outside of Patagonia and is an IBA. Nearby to the south of Patagonia is the most famous (to birders) rest area in America, on Route 82, a birding hotspot for the rose-throated becard. Ecoregion NA1303. Ramsey Canyon Preserve, The Nature Conservancy, Arizona (11). America’s first NNL, located in the Huachuca Mountains, has exceptional biological diversity, with 14 species of hummingbirds alone. This is the most species of hummingbirds to be found at one place in the U.S. It is adjacent to the Miller Peak Wilderness in the Coronado NF. Ecoregion NA302. San Felipe Creek, BLM El Centro District, California (32). This is the last remaining natural desert stream in the Colorado Desert, also called the San Sebastian Marsh. Rare and endangered species include desert pupfish, Peninsular bighorn sheep, least Bell’s vireo, yellowbilled cuckoo, Southwestern willow flycatcher, unarmored three-spined stickleback, black rail, and arroyo toad. Additionally, there are many species of special concern, including yellow-breasted chat, yellow warbler, loggerhead shrike, Vaux’s swift, summer tanager, lowland leopard frog, California red-legged frog, and Orcutt’s aster. Ecoregion NA1310. Coronado National Memorial, Arizona (33). Located in the Huachuca Mountains, one of the sky islands, this park consists of canyons draining south into Montezuma Canyon, which is a tributary of the San Pedro River. A limestone cave is also found within the park. Hiking trails lead to the cave and through Montezuma Canyon. The Arizona National Scenic Trail (NST) (see) begins at the Mexican border in the park. The memorial is part of the Huachuca Mountains IBA for rare neotropical species. Ecoregion NA302. Joshua Tree National Park, California (site 34). Although known for the iconic yucca trees, this is also a rock climbing area. Rocks rise from the desert floor in squared columns and pillars. Major points of interest are Park Boulevard, with its rock formations, Ryan Mountain, Hidden Valley, the Wonderland of Rocks, Desert Queen Ranch, Cholla Cactus Garden, and Lost Palms Oasis. The southern parts of the park have cholla cactus and creosote bush as the area grades into the Sonoran Desert. The NP is part of the Mojave and Colorado Deserts biosphere reserve. Ecoregions NA1308 and NA1310. Organ Pipe Cactus National Monument, Arizona (3). See description under Biosphere reserves. Ecoregion NA1310. Saguaro National Park, Arizona (35). The western Tucson Mountain unit and eastern Rincon Mountain units are on each side of Tucson. The Arizona-Sonora Desert Museum is an outdoor education center adjacent to the park. The western unit is viewed from the nine-mile Bajada Loop Drive, providing access to the finest saguaro stands. The eastern unit rises from the Sonoran desert to desert grassland and peaks of ponderosa pine. Cactus Forest Drive provides access to the trail system. Ecoregion NA1310 and NA302. Sierra de San Pedro Martir National Park, Baja California (36). This boulder-studded park contains conifer forest at higher elevations, grading into the Sonoran and Baja California deserts at lower elevations. It is an IBA. Ecoregions NA526, NA1201, NA1301, and NA1310. Tumacacori National Historical Park, Arizona (37). This historical area is part of the Upper Santa Cruz River IBA for riparian birds, known for gray hawks and yellow-billed cuckoo. Ecoregion NA1303. Alamo Lake, US Army Corps of Engineers (USACE), Arizona (38). Located on the Bill Williams River, this flood control lake is managed as an Arizona state park. Eagles and waterfowl may be seen. Ecoregion NA1310. Camp Dyer Diversion Dam and Hank Raymond Lake, Bureau of Reclamation, Arizona (39). Located 35 miles northwest of Phoenix on the Agua Fria River, this facility provides water to the Maricopa Water District. Ecoregion NA1310. Granite Reef Diversion Dam, Bureau of Reclamation, Arizona (40). Located four miles downstream of the confluence of the Salt and Verde Rivers and 22 miles east of Phoenix, this facility diverts water to irrigation canals. Ecoregion NA1310. Imperial Dam and Desilting Works, Bureau of Reclamation, Arizona-California (41). Located 18 miles northeast of Yuma, this dam lifts water into the All-American and Coachella Canals of California and Gila canal of Arizona. Located on the reservoir are Imperial NWR, Mittry State Wildlife Area (AZ), and Picacho State Recreation Area (CA). The area is an IBA for Yuma clapper rail and California black rail. Ecoregion NA1310. Laguna Diversion Dam and Mittry Lake Wildlife Area, Bureau of Reclamation, Arizona-California (41). The area located 13 miles northeast of Yuma between Laguna and Imperial Dams is managed for waterfowl. Ecoregion NA1310. Mormon Flat Dam and Canyon Lake, Bureau of Reclamation, Arizona (42). Located 51 miles northeast of Phoenix, Canyon Lake is in the Tonto NF. Ecoregion NA1310. New Waddell Dam and Lake Pleasant, Bureau of Reclamation, Arizona (43). This reservoir on the Agua Fria River stores Central Arizona Project water and river runoff. Ecoregion NA1310. Parker Dam and Lake Havasu, Bureau of Reclamation, Arizona-California (44). Located below the mouth of the Bill Williams River, Parker Dam impounds Lake Havasu, the beginning point for the Colorado River Aqueduct to California and the Central Arizona Project Aqueduct to Phoenix and Tucson. Marshes at the upper end of Lake Havasu are managed as part of the Havasu NWR (see). Ecoregions NA1308 and NA1310. Palo Verde Diversion Dam, Bureau of Reclamation, Arizona-California (45). This dam, located nine miles northeast of Blythe, provides water to the Palo Verde Mesa in California for irrigation. Ecoregion NA1310. Stewart Mountain Dam and Saguaro Lake, Bureau of Reclamation, Arizona (46). Located 41 miles northeast of Phoenix, this dam stores Salt River water for irrigation. Reservoir recreation facilities are operated by the Tonto NF. Ecoregion NA1310. Arizona National Scenic Trail (NST), Arizona. Extending 800 miles from Mexico to Utah, the trail crosses the Vermillion Cliffs NM, Kaibab NF, Grand Canyon NP, Coconino NF, Tonto NF, Four Peaks Wilderness, Superstition Wilderness, Coronado NF, Oracle State Park, Saguaro NP, and Coronado National Memorial. Ecoregions NA302, 503, 1303, 1304, and 1310. Black Canyon National Recreation Trail (NRT), BLM Phoenix District, Arizona (22). This 80-mile trail from State Route 74 west of New River to the Prescott NF east of Mayer follows a route historically used for sheep herding. Ecoregions NA503 and NA1310. Pacific Crest NST, California. Extending 2,600 miles from Canada to Mexico, the trail passes through some of the most scenic areas in California. Coastal sage and chaparral lands that the trail passes through, from south to north, are Cleveland NF, Hauser Wilderness, San Bernardino NF, San Jacinto Wilderness, San Gorgonio Wilderness, Angeles NF, Sheep Mountain Wilderness, San Gabriel Wilderness, Kiavah Wilderness, Domeland Wilderness, and Sequoia NF. Ecoregions NA527, 1201, 1203, 1308, 1310. Sixshooter Canyon NRT, Tonto NF, Arizona (47). From the Icehouse CCC Campsite south of Globe, this trail ascends six miles to Pinal Peak in a ponderosa pine forest. Ecoregion NA503 and NA1303. Palm Canyon Creek, San Bernardino National Forest and Santa Rosa and San Jacinto National Monument, California (48). The nation’s largest fan palm oasis, bighorn sheep, and willow flycatcher are protected in the eight-mile WSR stretch. Ecoregion NA1310.